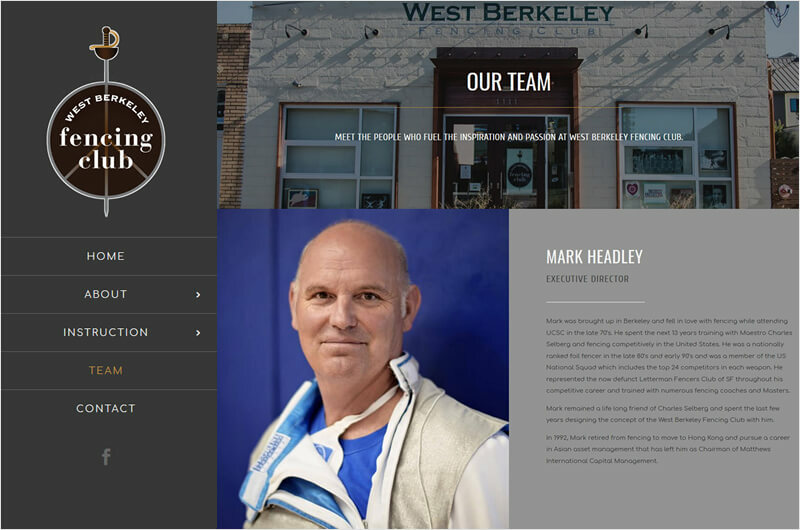 In the heart of Berkeley is a club that is dedicated to teaching the modern sport of fencing. The West Berkeley Fencing Club offers beginner and experienced fencers an opportunity to fence, train and learn. The space has been completely renovated and is both functional and beautiful. Executive Director Mark Headley met ruby slipper while collaborating on another project — The Selberg Institute, which operates land preserves in Southern Oregon. This connection turned into a project for the fencing club in Berkeley. ruby slipper utilizes the solid Divi WordPress theme, which accommodates vertical left navigation, as well as a unique checkerboard pattern of stacking content. The site features information about the club, a useful calendar, instruction for all ages, and the gifted team of fencers who make up this very special place. I was at a conference of fencing coaches and club owners all last week and there was a session on internet presence. Our site/your work received much praise.